Delicious, nutritious, gluten free breakfast that tastes like dessert. Chocolate Strawberry Overnight Oats with oats, almond milk, cocoa powder, peanut butter, strawberry and banana. 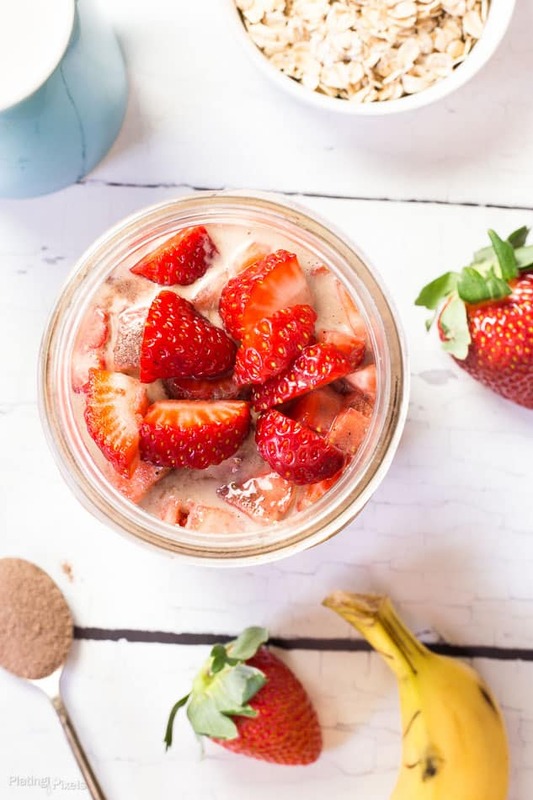 Within this recipe post you’ll make nutritious gluten free vegetarian chocolate and strawberry overnight oats. Plus you’ll learn the basics of overnight oats to make you own endless flavor combinations. I’ve been working on a morning routine and balanced breakfasts has always been part of that. I may not always get out of be as early as I’d like (I’m working on that by hitting snooze less), but do always save time to enjoy a nutritious breakfast. One way to save a bit of time and still have your breakfast each morning is overnight oats. 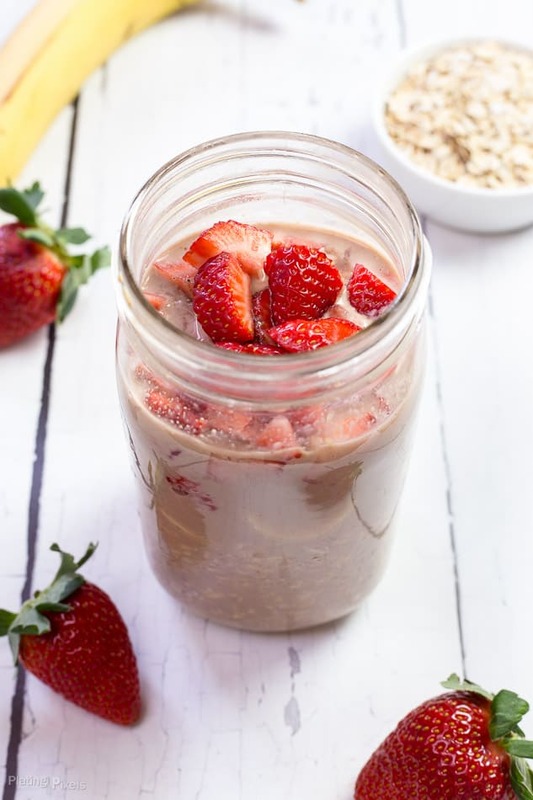 How about gluten free Chocolate Strawberry Overnight Oats to start your day? Overnight oats takes just a few minutes to prep, then refrigerate overnight (hence the name) and it’s ready to go the next day. You can make a large batch and enjoy over a few days as well. Besides my usual smoothies, overnight oats are my next favorite breakfast. It’s full of balanced nutrients like protein, fiber, complex carbs and vitamins, without much calories or sugars. On top of that it tastes like dessert without any added sugars. Sweetened almond milk and fresh fruits like banana provides plenty of sweetness. What is ideal ratio of oats to water for overnight oats? Overnight oats are simple and completely customizable once you know the basics. You want roughly a 1:1 ratio of oats to liquid. So if you have 1 cup of oats, add 1 cup of almond milk for example. You can add any mix-ins and it won’t change the ratio much. For this recipe I used slightly less oats since I like a bit of liquid leftover. Experiment and find your favorite ratio and flavors. Flavor profiles: Sweet and rich chocolate oats paired with sweet banana and slightly tart strawberries. Texture: Soft and chewy oats, without cooking! Dietary Options/Substitutions: This recipe is gluten-free, vegetarian and dairy-free. Omit peanut butter and use soy milk if allergic to nuts. Chocolate Strawberry Overnight Oats with oats, almond milk, chocolate powder, peanut butter, strawberry and banana. Place almond milk, cocoa powder and peanut butter in a large mason jar. Seal and shake well to combine (if using a bowl or container, mix well with a whisk). Add in oats, banana and strawberry; stir or shake to combine. Seal and refrigerate overnight to soften oats. Serve cold or heat if desired (I prefer it cold). That’s how I was and finally decided to try them. Now I’m hooked! Thanks Jia! They’re great as you can easily double or more to make a huge batch. Glad I could introduce you to the product and it’s wonderful in these overnight oats. Thanks Denay! I love overnight oats! I will make a big batch that my husband and I can grab throughout the week. This one looks delicious! Me too and that’s the best way to make them! Thanks Carly! It goes together so well, not just in desserts. Thanks so much Chrystie! I looove strawberries with oats. Great recipe for a healthy & delicious breakfast! My thoughts exactly. Thanks Kamara! I would have to use frozen berries as I picked a ton last summer and need to use them up, but this recipe would work great for that! I’d love to pick my own. I usually buy a frozen bag to always have on hand. Works just as good. Thanks Bethany! Totally in love with this recipe. Wish I had a spoon and a bowl full of this right now! It sure would be! Thanks and hope you like it Valentina! Chocolate + strawberry is a match made in heaven. These oats would definitely get me out of bed in the morning! Haha that’s a good point. Thanks Les! This sounds amazing! Haven’t made overnight oats yet but definitely need to give it a try! Sounds like now is a good time to start. Thanks Sherri! This looks so good! Gonna try it the next time I have oats! Glad to hear that and thanks Roslyn! I am already a huge fan of overnight oats, but I haven’t tried chocolate with banana and strawberry. Looks delicious! I highly recommended it. Thanks Anne! I’m all about the convience and how healthy this is. All important thinks in my book too. Thanks Candy! Love that this has strawberries in it! Yum! Can’t go wrong with strawberries and chocolate. Thanks Kari! LOVE you ratio tips. I tend to make my oats too soupy and it’s really annoying! This recipe looks great and I love the little prep work to have a killer breakfast the next day! I like mine just slightly soupy, but not too much. You’ll probably want to use slightly less almond milk then (like 1:1). Thanks Chrissa! This looks absolutely amazing! 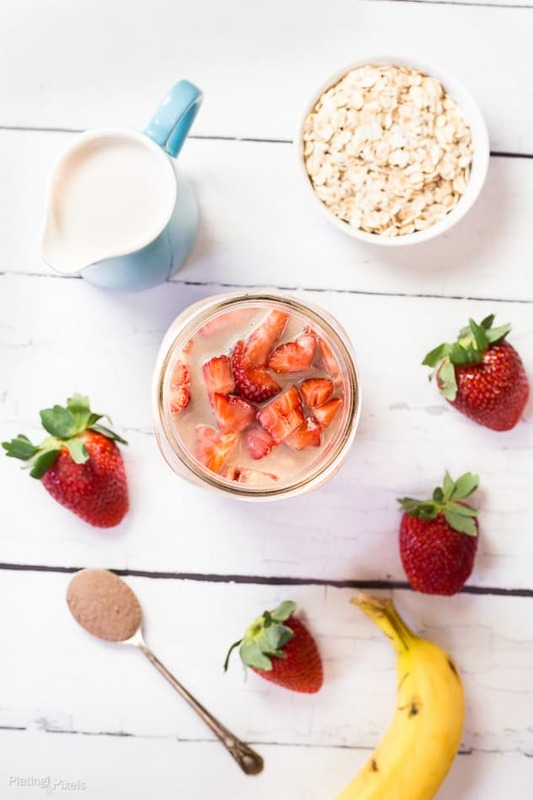 My kids and I absolutely love oatmeal and this sounds like it would be right up our alley (all strawberry lovers here!) Thanks for sharing. I totally would be! It tastes sweet but it still good for you. Thanks Ashley! I am transitioning into a more vegan lifestyle for my own personal health as well as environmental factors and this looks so delicious, i’m for sure making this! Glad I could provide some inspiration and a recipe idea. Thanks for the comment Nicole! I adore overnight oats! They make my mornings so much easier! I use them a lot too Molly! Even blended in my smoothies. I keep meaning to try overnight oats and this looks like such a bright and delicious way to start the day! It sure is. Thanks Marlynn! I like the idea that this can be done overnight and be ready to chow down in the morning. Can’t get much easy than that right? Thanks Peter! I’ve never tried overnight oats but your tips and tricks are going to help me make that leap! Thanks for this great post! You totally should Nellie. They’re super easy. Thanks and you’re welcome! They’re so easy but I forget to make them too. Glad the tips helped. Thanks April!